How to check if my Company is depositing EPF amount to EPFO / Trust? You are here: Home / Fixed Income (Bank FDs,RDs,PF etc) / How to check if my Employer is depositing EPF amount with EPFO / Trust? How to check if my Employer is depositing EPF amount with EPFO / Trust? All the companies (establishments) which employ 20 people or more have to compulsorily deposit EPF dues every month. After deducting the Employee Provident Fund from the employee’s salary, the employer HAS to deposit the money with EPFO (Employees Provident Fund Organization). It is a crime if an employer does not deposit the EPF money. An employer can be jailed if they fail to deposit the EPF money with EPFO. Most of the big companies or MNCs might be very prompt in depositing EPF money, but this may not be the case with all the Small & Medium Establishments. I have received few queries on ‘companies not depositing the EPF dues’ and queries on ‘how to check if the employer is actually depositing the EPF money after deducting the amount from the employee’s salary’. If you have linked your UAN with Aadhar, you can receive monthly updates of PF credits to your mobile number linked to your UAN. There is another online provision provided by the EPFO, wherein an employee can check if the company is covered under EPF scheme or not. 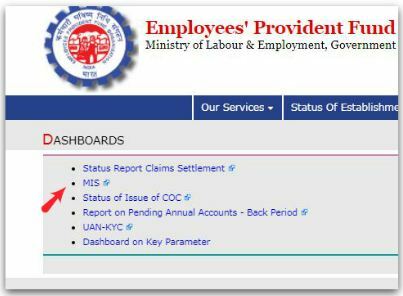 Using this online facility, an employee can also check if the company has been depositing the EPF dues on a monthly basis for all the employees who are covered under EPF scheme. In case, you are an employee who is contributing to EPF then you can also check if your name appears in the list of employees for whom PF dues have been deposited on a monthly basis. How to find if your Establishment is an Exempted one online? Under this scenario, it is even more important for you to check if your name is enrolled in EPF Scheme or not. Click on Dashboards under EPFO Corner Menu tab in the home page. 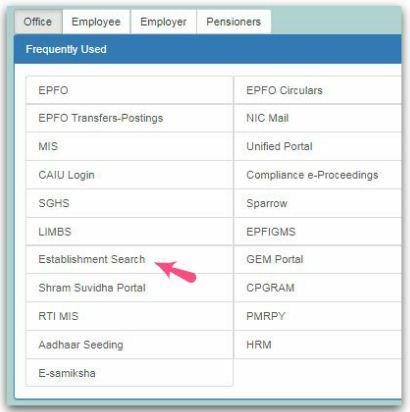 Kindly click on ‘Establishment Search’ option under the ‘Office’ tab. In the new window, you have to provide your Establishment name, its code number (optional) and captcha code. Click on ‘Search’ button. I have considered ‘INFOSYS’ as an example for Establishment name. Click ‘view details’ of your Establishment under List of Establishments. Under Establishment Details, you can find the concerned EPFO Regional office that administers your Establishment’s Trust. How to check if my name is in PF rolls or not? Is my company depositing EPF amount to Trust/EPFO? Whether your Organization is an exempted one not, if you are contributing to EPF scheme via Trust or to the EPFO directly, your name has to be available in the PF roll maintained by the EPFO. Let’s now understand the procedure to check if your employer is depositing EPF amount periodically or not..
Let’s continue with the above ‘INFOSYS’ example. As an employee of ‘Infosys’ you would like to know if your employer is depositing the EPF dues to the Trust maintained by them on a monthly basis, click on the ‘View Payment Details’ link under the Validity Status section. To view EPF Member names (Employee names), you have to then click on ‘No of Employee’ figure in the new window. Once you click on the ‘no. 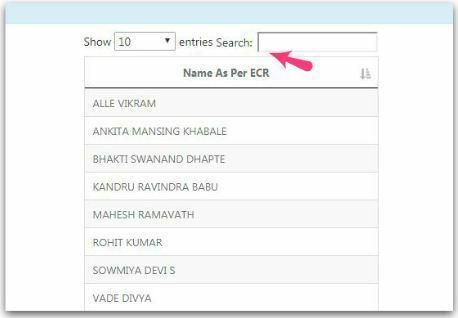 of employees’ link, you can provide your name in the ‘search box’ (as shown in the below image). If your name appears in the list then your company is depositing the EPF money in your EPF Account with the Trust/EPFO. EPF Interest Income & Withdrawals | Tax Implications | Is EPF Interest taxable? Interest on Inoperative EPF accounts | Will I get interest on my Dormant EPF account? But, when I followed these steps, it doesn’t display anything when I click on search entering captcha. Tried with Infosys also for example as shown in above pictures, but doesn’t work. Any suggestions please? I have just tried the same and its working, able to see the required details as given in the above article. May I know if you are receiving any error message while performing the search..?? Great information, taken out your important time which is now very useful to us. Thanks for your time and valuable information again. I like your blog. It is very interesting and informative. I always prefer and appreciate this type of post which is really beneficial for me as well as others. Really useful points, helped me a lot. Hii, Nice post such a valuable information thanks for that such valuable information keep up the good word. Thanks for posting such a nice article. But Mr. Reddy, can you just explain why EPFO is not crediting interest for 2017-18 till today. Statement showing no interest credited as of now. Why is this? Members are bit worried. Generally, the EPFO pays the interest dues by June-July every financial year. Even I am not sure for the delay. You may post your grievance to the EPFO online ..visit this link..
Yeah, had been busy with important and unavoidable personal commitments! I had recently published an article on ‘Best Mutual Funds 2018’, you may kindly go through it. Will try to publish latest review on MFs by End of this year.